A "fledgling" American Bald Eagle was admitted to the clinic on March 30 from Cape Coral. 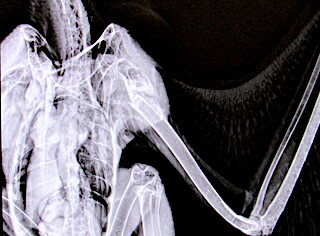 Radiographs show a fractured humerus of the eagle's left wing. Due to the location of the fracture, surgery is not an option. 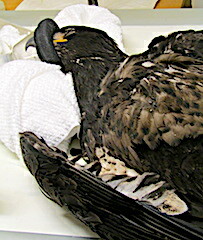 The wing will be immobilized and the eagle will recieve nutritional and supportive care as it heals. Over the weekend, the young bald eagle was placed in a body wrap to immobilize the wing. It will remain in this wrap for three to four weeks and the healing progress will be checked with radiographs. 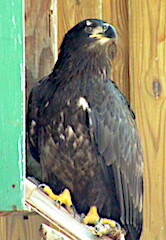 The eaglet has been eating well on its own and is very bright and alert. It has been moved to a small outside enclosure to continue its healing. Radiographs taken yesterday afternoon show the bones are aligned and appears to be healing better than expected. The eagle continues to eat well on its own and remains bright and alert. 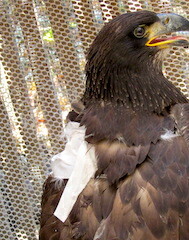 The fledgling eagle received physical therapy yesterday to keep the muscles in its injured wing strong while it heals. Due to the eagles very alert mentality, future physical therapy will need to be done under general anesthesia to ensure the muscles are worked properly and further injury is prevented. The eagle was sedated today so the veterinarians could take new radiographs and perform physical therapy. Over the last couple of days, the eagle has been removing the wrap that is stabilizing its wing. Veterinarians say this has slowed the healing process because the wing is not being fully immobilized. New wraps were placed on the wing today. 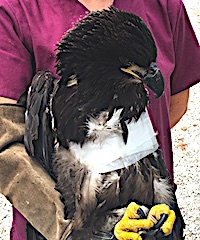 The eaglet received a bandage change and physical therapy yesterday. New radiographs were taken to monitor the progress of healing at the fracture site. The eagle was kept inside overnight to monitor the new wrap which was put on its wing. Recent radiographs show bony callous is forming (this is a good sign) at the fracture site and the bones are aligning. 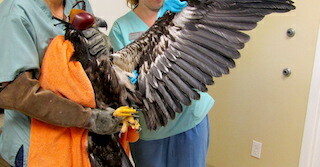 The eagle continues to receive physical therapy every three days. During a physical therapy session, measurements were taken which show improved range of motion in the eagle's wing. The wing wrap has been removed to allow it to do its own physical therapy. It was moved to the Large Flight enclosure for more space. This enclosure has a live camera that can be watched by clicking our homepage and clicking the tab that says "Live Cameras". The most recent goniometry (range of motion) measurements show much improvement since the patient started doing its own physical therapy. It has been observed by the rehabilitators taking short "hopping" flights around the Large Flight enclosure. 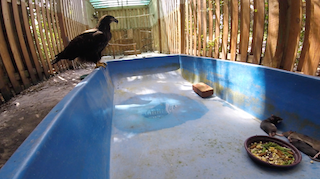 Two other juvenile eagles recently admitted to the clinic are now in the enclosure with #17-805. The eagles were given live prey as a training exercise yesterday afternoon. 17-805 showed immediate interest in the food, however was not observed having caught any of the prey. 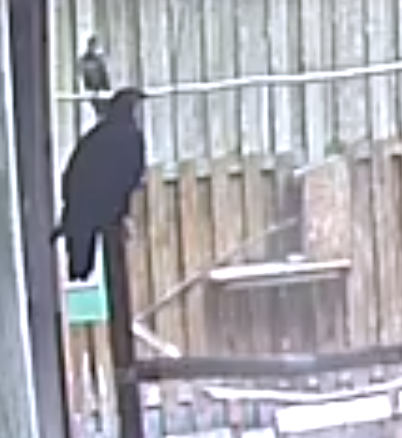 During the live prey training, 17-805 was observed on camera making short, controlled flight attempts. Yesterday, the young bald eagle was observed by the veterinarians taking longer, more controlled flights. 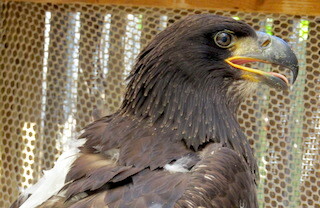 Although it still has to master flying, veterinarians say its prognosis for release looks good. The eagle can often be observed on our live camera perching in an area that can only be reached through flight. 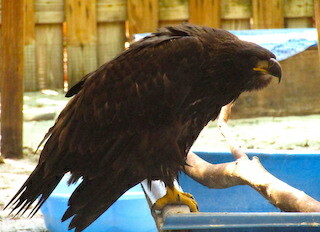 The juvenile bald eagle was cleared for release by veterinarians yesterday after showing full flight capabilities. Release date and location are pending. 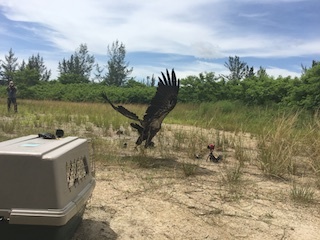 The juvenile bald eagle was successfully released in Cape Coral to the same area it was found over three months ago. Check out the "In The News" section of our website to see the media coverage of the release!